My concern in reviewing Fear for the Nevada County Democrats is that so much of it has already been shared in media reporting. However, I believe Fear is a very important chronicle of our day-to-day lives under President Trump. Sometimes just turning on the TV puts us in overload, hearing about the level of chaos in our country’s administration. This book takes a “left brain” approach, and it is still a frightening chronicle. Through decades, the American people have developed trust for the writing and research of Bob Woodward. We give him and his co-author, Carl Bernstein, credit for assisting in bringing down Richard Nixon with their book, The Final Days. He has won two Pulitzer prizes for his work with The Washington Post. His style is that of a “dogged investigative reporter,” and he doesn’t embellish with his opinions. 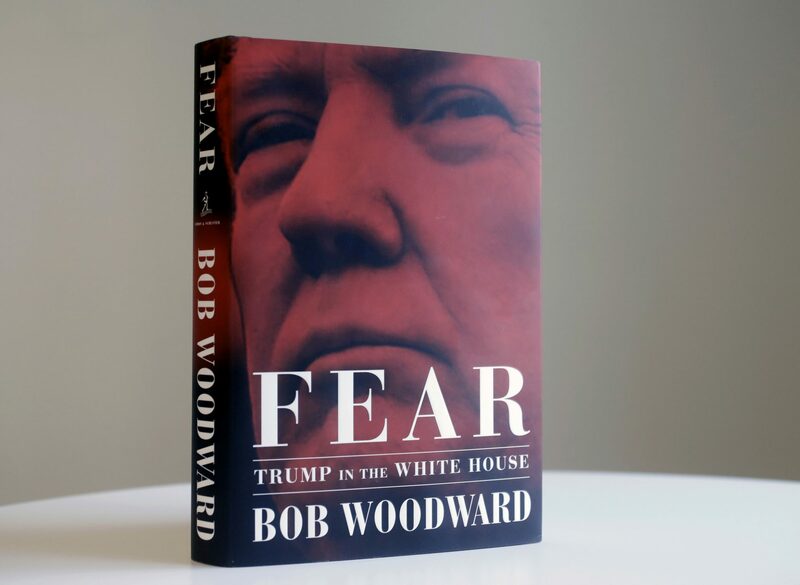 Even his descriptions of emotional encounters focus on “the facts – just the facts.” Woodward is journalistic truth’s gold standard. Woodward moves chronologically through the campaign, and takes us up to the time of the resignation of Trump’s lawyer, John Dowd. At the time of this writing, he didn’t know about the conviction of Paul Manafort or the plea deal of Michael Cohen, and he didn’t address collusion with the Russians. I found the fact that he didn’t find anything conclusive about collusion in his research intriguing. The Russia investigation is not part of the revelations in this book. Feardoesn’t tell us much more than we already know; however, I believe it is very important to read. Taken together with Malcom Nance’s latest book, The Plot to Destroy Democracy: How Putin and His Spies Are Undermining America and Dismantling The West, we are presented with a broad picture of our current global political dilemma. The results are shocking and dismaying. But, better to know and see how each of us can act than to keep our heads in the sand and hope for the best. From Priebus you hear of the chaos of White House decision-making: “When you put a snake and a rat and a falcon and a rabbit and a shark and a seal in a zoo without walls, things start getting nasty and bloody.” Trump, having promised that his administration would be staffed by “the best people,” has instead made the White House a school for scandal. “That’s what happens,” John F. Kelly, Trump’s current chief of staff, is quoted as saying about the president in a meeting. “He’s an idiot. It’s pointless to try to convince him of anything. He’s gone off the rails. We’re in Crazytown.” Cohn and Jim Mattis, the Secretary of Defense, had “several quiet conversations” about what they called “The Big Problem, i.e., the President did not understand the importance of (our )allies overseas, the value of diplomacy, or the relationship between the military, the economy, and intelligence partnerships with foreign governments.” Over and over again, we see vivid scenes of feckless and reckless decision-making by Trump, and then mad scurrying by his aides to undo the damage. These episodes include strife between advisers and Cabinet secretaries who are no longer there (like former national security adviser H.R. McMaster, former Secretary of State Rex Tillerson, and strategist Steve Bannon). We are informed that Defense Secretary Jim Mattis ignored an order from the president to assassinate Syria’s President Bashar al-Assad, and we are shown many other illustrations that convey the panicked frustration of aides who see themselves as protecting the public from an out-of-control President. Along with these revelations, we learn that Trump doesn’t ever touch a computer keyboard and that his description in a deposition of what he did for a living took up 16 pages. Wasn’t lying also Nixon’s undoing?